Pacific Street was covered in mud and debris after Thursday morning's water main break near Albany Avenue in Crown Heights. CROWN HEIGHTS — A large water main break on Pacific Street forced the evacuation of 50 people from their homes, damaged cars and flooded nearby roads for four hours, according to witnesses and officials. The 48-inch pipe ruptured near Albany Avenue at about 4 a.m., sending water shooting into the air and flooding the street for hours, according to officials and witnesses. Tiffany Langlaise, 28, lives on Pacific Street and heard a loud noise just after 4 a.m., calling 911 when she saw the deluge. “As I’m calling them, I’m saying ‘There’s something flying out the ground.’ … Ground water is filling the whole block, the block is flooded,” she said. The break damaged both her and her mother’s cars, blowing out a windshield and soaking the interior, she said. Langlaise was just thankful no one was outside when the main erupted. “I was just glad that I didn’t start walking to work, because I walk over that path. I walk exactly that way to work,” she said. 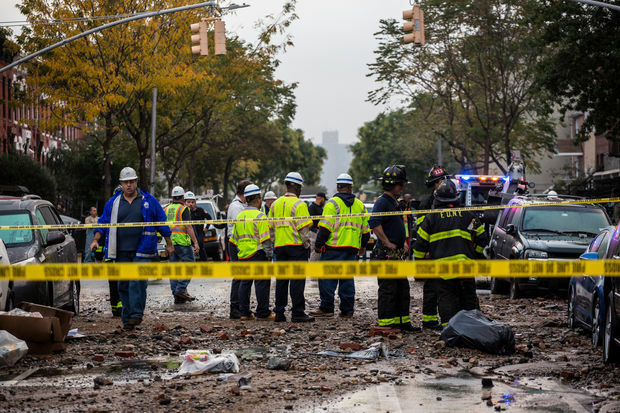 There were no reported injuries, but 50 people had to evacuate their homes, FDNY officials said. Water service was not affected by the break, according to the Department of Environmental Protection. Emergency workers stopped the leak just after 8 a.m. Thursday, according to the DEP, but Pacific Street was still covered in debris and closed while crews assessed the damage and worked to repair the break.